Præsident i LEN, Paolo Barelli fortalte på pressemødet, at ikke mindre end 645 svømmere fra 47 nationer deltager ved europamesterskabet. Pressemeddelelsen er udsendt af LEN, 2. august 2018, forud for starten på EM Langbane. 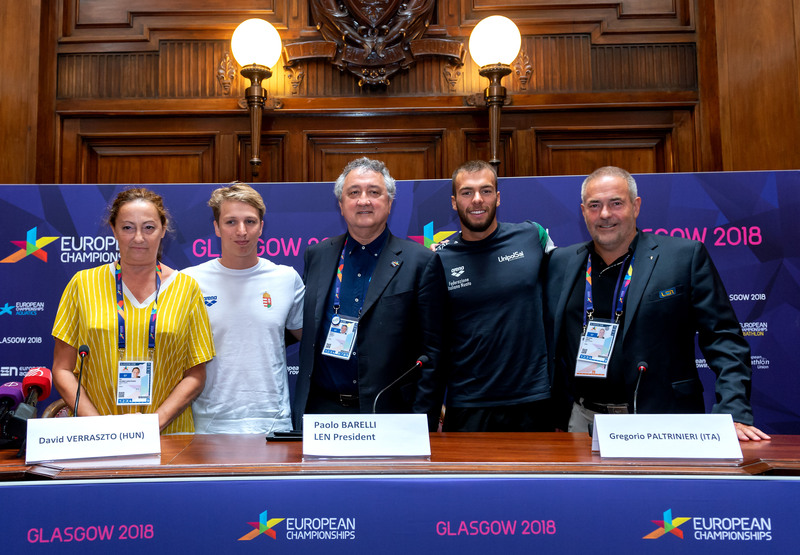 More than 1,000 athletes, more than 200 journalists and more than 40 broadcasters – European Aquatics are ready to put on the greatest show once again, as President Paolo Barelli said in the LEN’s opening press conference on the eve of the European Championships in Glasgow. Two greats from the swimming meet, Olympic, world and European champion Gregorio Paltrinieri and double title-holder David Verraszto are in top shape and keen to continue their respective golden passages. LEN President Paolo Barelli was happy to announce that the upcoming European Championships would see more than 1,000 athletes participating in the four aquatic disciplines. - Alone in swimming we will have 47 national federations with 645 swimmers and let me emphasise that LEN has 52 members and 47 are here with competitors, this is a brilliant number, Mr. Barelli said at the opening press conference. In diving 23 NFs entered while the artistic swimming and open water swimming events are to feature athletes from 22 NFs apiece. The President emphasised that LEN was convinced that the new format of the European Championships with six sports in Glasgow and athletics in Berlin would be a tremendous hit in the sport market. Følgende personer deltog ved LENs pressemøde. - We are expecting outstanding viewing figures and great media coverage and of course fantastic performances from our athletes. Now, the field is yours, Mr. Barelli said, giving the floor to the two swimming greats sitting next to him at the conference. Gregorio Paltrinieri clinched – or rather swept – all titles on offer in the past five years and enjoys an unbeaten run in the 1500m free in long-course majors, the Italian’s motivation is still the same. - I’m here to win again as I enjoy the challenge as much as ever, the Olympic champion said. - Recently Mykhailo Romanchuk from Ukraine have starting pressing me, and this is great as I feel that I have to improve every year. Greg has already got some adventures in open water swimming, though his European Championships premiere will not happen here. - The lake is just too cold here but I’ve started racing in open water and perhaps next year I will test myself at the World Championships and maybe make a try to qualify for the Olympics. I love open water but you need a lot of experience in order to be successful. Another title-holder, David Verraszto, whose success story also began in 2014, aims to become the oldest ever winner of the 400m IM. - This is one of the big challenge for me here in Glasgow the 30 year-old said. - I think I’ve managed to reach a good shape, this I have to also thank to Gregorio whom I was training together in Sierra Nevada. LEN Bureau Members and swimming liaison Pia Holmen talked about the global premiere of a new event, the 4x200m mixed free relay which surely give an extra value to the championships. Media liaison Per Rune Eknes added that this event with all the new features in broadcasting and in media shapes the future of sports and said he was happy to see LEN was among the first ones to embrace the new ideas. I morgen starter det første indledende afsnit ved EM Langbane 2018 klokken 10.30 (dansk tid). På linket her finder du resultaterne derfra.